Bamboo is one of the most sustainable materials you’ll ever come across. Bamboo is one of the most sustainable materials you’ll ever come across. When it’s mature, we cut it for use and a new harvest replenishes in just five years. 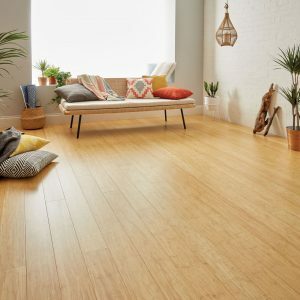 Although it’s not strictly speaking a wood – bamboo is a family of grass – it forms its own unique grain patterns and can be worked into extremely hardwearing floorboards, with the natural look and qualities of hardwood. As a bamboo flooring company, we at Woodpecker use two techniques to turn bamboo into boards. One is to laminate strips of bamboo together forming solid boards. The other process is called strand weaving, where bamboo fibres are bound together and compressed to form boards with the tensile strength of steel. The range of colours and styles available in our bamboo wood flooring range means that there’s a product to suit just about any decor scheme. Each board is prefinished with five coats of UV scratch resistant lacquer and they come in tongue and groove or glueless ‘clic’ systems, making them just as easy to install as any other wood floor we make.